Posted by plassaaj on Saturday, October 31, 2015 in Abdomen Imaging, Image Segmentation. Zhoubing Xu, Andrew J. Asman, Rebeccah Baucom, Richard G Abramson, Benjamin K. Poulose, and Bennett A. Landman. “Quantitative CT Imaging of Ventral Hernias: Preliminary Validation of an Anatomical Labeling Protocol.” PLoS ONE. 2015 Oct 28;10(10):e0141671. 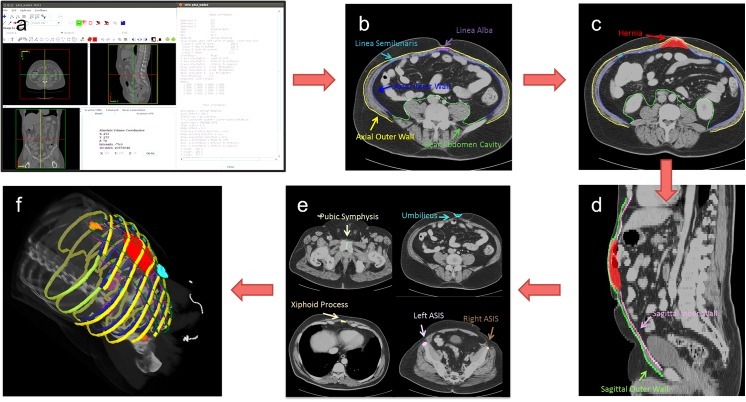 We described and validated a quantitative anatomical labeling protocol for extracting clinically relevant quantitative parameters for ventral hernias (VH) from routine computed tomography (CT) scans. This information was then used to predict the need for mesh bridge closure during ventral hernia repair (VHR). A detailed anatomical labeling protocol was proposed to enable quantitative description of VH including shape, location, and surrounding environment (61 scans). Intra- and inter-rater reproducibilities were calculated for labeling on 18 and 10 clinically acquired CT scans, respectively. Preliminary clinical validation was performed by correlating 20 quantitative parameters derived from anatomical labeling with the requirement for mesh bridge closure at surgery (26 scans). Prediction of this clinical endpoint was compared with similar models fit on metrics from the semi-quantitative European Hernia Society Classification for Ventral Hernia (EHSCVH). High labeling reproducibilities were achieved for abdominal walls (±2 mm in mean surface distance), key anatomical landmarks (±5 mm in point distance), and hernia volumes (0.8 in Cohen’s kappa). 9 out of 20 individual quantitative parameters of hernia properties were significantly different between patients who required mesh bridge closure versus those in whom fascial closure was achieved at the time of VHR (p<0.05). Regression models constructed by two to five metrics presented a prediction with 84.6% accuracy for bridge requirement with cross-validation; similar models constructed by EHSCVH variables yielded 76.9% accuracy. Reproducibility was acceptable for this first formal presentation of a quantitative image labeling protocol for VH on abdominal CT. Labeling-derived metrics presented better prediction of the need for mesh bridge closure than the EHSCVH metrics. This effort is intended as the foundation for future outcomes studies attempting to optimize choice of surgical technique across different anatomical types of VH.